"The Quarterdeck of the Navy"
Recruit Training Command, Great Lakes (RTC Great Lakes), is a unit within the United States Navy primarily responsible for conducting the initial orientation and indoctrination of incoming recruits. It is part of Naval Service Training Command, and is located at Naval Station Great Lakes, Illinois. RTC Great Lakes is also commonly referred to as boot camp and recruit training, or RTC. Since the BRAC-directed closures of Recruit Training Commands in Orlando, Florida in 1994 and San Diego, California in 1993, RTC Great Lakes has been the only enlisted basic training location in the U.S. Navy and has been called "The Quarterdeck of the Navy" since it was first utilized in July 1911. Running at approximately eight weeks long, all enlistees into the U.S. Navy commence their enlistments at this command. Some recruits may take longer than eight weeks if they do not pass certain tests. Upon successful completion of basic training, qualifying sailors are sent to various apprenticeship, or "A schools", located across the United States for training in their occupational speciality, or ratings. Those who have not yet received a specific rating enter the fleet with a general designation of airman, fireman, or seaman. 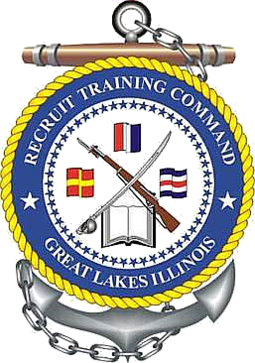 Recruit Training Command is located at Naval Station Great Lakes in the city of North Chicago, Illinois in Lake County, north of Chicago. It is a tenant command, meaning that although it is located on the base, it has a separate chain of command. After the Spanish–American War, the U.S. Navy began investigating 37 sites around Lake Michigan in order to locate a new training center in the Midwest, an area that contributed 43 percent of the Navy’s recruits at the time. Illinois Congressional Representative and chairman of the Committee on Naval Affairs (1900–1911) George Edmund Foss pressed for the decision to locate the center at its present location and was later called "The Father of Great Lakes". Foss Park, just north of the base in North Chicago, is named in his honor. It is likely the facility would have been located elsewhere had it not been for the $175,000 contribution of the Merchants Club of Chicago to purchase the land. Rear Admiral Albert A. Ross was the station’s first commander and the base's Ross Field and Ross Auditorium were later named in his honor. The first flag was planted on site on 1 July 1905. President William H. Taft dedicated the station six years later on 28 October 1911. In that same year, the station received its first trainee, Seaman Recruit Joseph W. Gregg. Naval Station Great Lakes was at the forefront of the racial integration of the Navy. African-Americans were permitted to enlist for general service in the middle of 1942 receiving training at Great Lakes as well as Hampton, Virginia. Previously they had been restricted to special duties. The Navy commissioned its first African-American officers, later known as the "Golden Thirteen", at Great Lakes in February 1944. In July 1987, building 1405, the Golden Thirteen Recruit In-Processing Center, was dedicated in their honor. The surviving eight attended the ceremony. Navy recruit training is now exclusively conducted at Naval Station Great Lakes' Recruit Training Command. Prior to the mid-1990s, recruit training facilities included Naval Training Center Orlando and Naval Training Center San Diego. Female recruit training was previously limited to the Orlando facility. The Base Realignment and Closure Commission of 1993 resulted in the consolidation of recruit training to Great Lakes. Following the consolidation, the Navy undertook a massive recapitalization (recap) program to upgrade the Great Lakes Recruit Training facility. The recap included the construction of Camp John Paul Jones, a 48-acre (190,000 m2) site on land formerly owned by the Veterans Administration Hospital adjacent to Camp Porter. New barracks were also constructed and are referred to as "ships" by the recruits. Each "ship" was also named after an important ship in naval history, such as USS John F. Kennedy and USS Enterprise. Each "ship" can house up to 1,300 recruits during training. A 210-foot (64 m) Arleigh Burke-class destroyer simulator called USS Trayer (BST-21) was also constructed as part of the recap program also known as Battle Stations 21 (BST 21). The USS Enterprise Recruit Barracks Building is the eighth of fourteen built as part of a $763 million recapitalization program. The building is named after the eight USS Enterprises that have borne the name, including the two famous aircraft carriers pictured around the building's quarterdeck. The first is CV-6, which was a ship of the Yorktown class launched in 1936 (the most decorated Navy ship in history) and one of only three American carriers commissioned prior to World War II to survive the war. The nautical flags hanging on the quarterdeck of BLDG 7115 are from CV-6. The second is CVN-65, the world's first nuclear-powered aircraft carrier. Many of the displays on the quarterdeck of USS Enterprise (BLDG 7115) were donated by USS Enterprise (CVN-65). The USS Enterprise (BLDG 7115) has 120,000 square feet (11,000 m2) of space, enough to accommodate 16 recruit divisions of up to 88 recruits each. This facility integrates berthing, classrooms, learning resource centers, a galley, and a quarterdeck, all under one roof. Each "ship" has a ship's officer who fills the role of commanding officer, a ship's leading chief petty officer who fills the role of command master chief, and a chaplain. USS Triton Recruit Barracks (Ship 12) was dedicated in ceremonies held on 25 June 2004. The facility honors the memory of two submarines named Triton and includes memorabilia from both ships, USS Triton (SS-201) and USS Triton (SSRN-586). Triton Hall is the fifth barracks constructed under the RTC Recapitalization Project, covering 172,000 square feet (15,979 square meters) in floor space. The facility is designed to accommodate 1056 recruits, and it includes berthing, classrooms, learning resource centers, a galley, a quarterdeck, and a modern HVAC system. On 17 May 2012, in a dedication ceremony, the long-missing ship's bell was added to the collection of artifacts in Recruit Training Command's USS Triton recruit barracks quarterdeck (pictured). U.S. Navy recruits begin their journey at Building 1405, Golden Thirteen, the Recruit In-processing Center in Camp Moffett. Recruits arrive at all hours, but mostly during the night. Before formal training can begin at Recruit Training Command, recruits are screened medically, dentally, and administratively. They receive a thorough round of inoculations, an initial issue of uniforms, and their first military haircut. They are taught basic grooming standards, the Uniform Code of Military Justice (UCMJ), and standards of conduct and are introduced to their recruit division commander (drill instructor). This first week of training, called P-days (processing days), lasts for approximately five days but can run a little longer depending on weekends, holidays, and the schedule of arriving recruits. During P-days, recruits are taught the basics of watch standing, they are given information to memorize, and they begin learning to organize their equipment. P-days conclude with a commissioning ceremony, led by the recruits' group commander (ship's officer), in which each division's guidon (divisional flag with division number) is unrolled. This ceremony marks the official start of their training. This week is considered the most intense week of physical conditioning. Recruits take their initial swim qualification test and learn military drill, the details of rank and rating, and the Navy core values. During Week Two, recruits learn the Navy chain of command, custom and courtesies, and basic watchstanding. Week Three consists of hands-on training. Recruits learn laws of armed conflict, personal finance, basic seamanship, shipboard communication, and Navy ship and aircraft identification. Recruits also take their first physical training test, performing as many sit-ups and push-ups as they can in two minutes and running 1.5-mile (2.4 km) for time. The time standards for the run and the number of push-ups and sit-ups are based on the recruits' ages, which range from 18 to 34. Dog tags are distributed this week, and recruits receive their first paychecks. Week Four mostly consists of weapons training. Recruits gain familiarity with the M9 pistol. Some time during the week, recruits receive a classroom lecture on firearms safety and operation of the M9. Recruits receive live-fire training with the M9. Recruits no longer receive training with the M500 shotgun or the M16 rifle. In past years, U.S. Navy recruits trained with the M16 rifle and the M500 shotgun. All U.S. Navy training on the M16 or M500 occurs at other locations. Week Five consists of learning more drill instructions needed for the military drill assessment. Week Five is also called "Hell Week", previously as this was when new recruits take over the daily chores necessary to keep the base running. However, since the redesign of RTC recruits no longer participate in all aspects of daily chores. It has kept its moniker because this is the most inspection and test intensive week. During Week Six, recruits learn shipboard damage control and firefighting skills. Recruits will learn to escape smoke-filled compartments, open and close watertight doors, use self-contained breathing apparatus (SCBAs), carry fire hoses and learn to extinguish fires. Week Six also includes the Confidence Chamber (tear gas chamber). Week Seven is the last week of Navy Basic Training. These seven weeks, combined with Processing Week, make up the approximate eight-week training cycle that each recruit must complete before graduating. Week seven includes a comprehensive test of the material covered by Navy Basic Training in a 12-hour exercise called "Battle Stations". This reinforces much of the instruction learned during Basic Training. Recruits must pass all the requirements of Basic Training to participate in "Battle Stations". Once recruits have successfully completed "Battle Stations" they become Sailors, don their Navy utility cover (also known as the utility cap or eight-point cover) and Pass In Review (PIR) at the USS Midway, Ceremonial Drill Hall. This officially marks the recruit's graduation and entrance into the United States Navy. ^ a b Naval Station Great Lakes Base Guide & Telephone Directory, Page 46. ^ a b Naval Station Great Lakes Base Guide & Telephone Directory, Page 47. ^ "Negroes in War-Stride." Wide World News Service. The Kansas City Star. Kansas City, Missouri. 20 September 1942. Page 19. ^ SECNAV Visits Naval Station Great Lakes. Friday, 13 October 2006. ^ RTC Ground-Breaking Ceremony Paves Way for Camp John Paul Jones. 2 October 2002 11:51:00 p.m.
^ The USS Trayer simulator was named after James Sheldon Trayer. ^ Trayer Commissioned at RTC. 20 June 2007 4:25:00 PM. ^ "USS Enterprise Commissioned at RTC". Naval Media Center, Daily News Update. 20 June 2005. ^ Strickland, Aaron (8 September 2007). "PCU George H.W. Bush Training Division Commissioned at RTC". Navy NewsStand. ^ Dedication Ceremony – USS Triton Recruit Barracks program dated Friday, 25 June 2004. ^ "Full Text of HR1098 Offered by Representative Chapa LaVia". LRB093 22590 KEF 52170. Illinois General Assembly. 2004. Retrieved 2008-09-13. ^ Lt. j.g. Liza Swart, USN (1 June 2012). "USS Triton Bell Rings On". NNS120601-25. Recruit Training Command Public Affairs. Retrieved 2012-10-10. and Kate, Wiltrout (26 April 2011). "Missing for decades, World War II sub's lost bell surface". The Virginian-Pilot. Retrieved 2012-10-10. Rhonda Savage was always curious about the brass submarine bell. Inscribed "U.S.S. Triton," it was the centerpiece of a handmade, glass-topped end table in a relative's home near Reno, Nev. Visitors weren't supposed to ring it, but sometimes they couldn't help themselves. The shiny artifact beckoned. Thanks to Savage's curiosity, the 14-inch diameter bell - technically government property, missing for more than four decades - is once again in proper hands..
^ a b RTC's Official P-Day Description. Wikimedia Commons has media related to Naval Station Great Lakes.